"It is important that I continue to expand and improve the creative part of my mind; experimenting with new concepts and developing new skills. To communicate from the heart; to inspire, and be inspired, through suggestion and impression; to explore atmospheric influences on natural form, the patterns and movement, studying light and shadow; this is what brings me the greatest joy. Welcome to my world...the west coast of Canada...my inspiration...I see it...feel it...paint it…and with telling my stories, I celebrate my love of place here on earth." Growing up in St. Catharines, Ontario, Ursula was happiest while expressing herself through her art and music. At 12 years old, she began exploring her artistic inspirations with carving in soapstone, painting in acrylic, playing the guitar and singing the songs she wrote. As a teenager, Ursula discovered the world of communicating through artistic expression. Ursula’s working world started at the age of 13 as horse groom at the Garden City Raceway in St.Catharines, Ontario. At age 14 she became an apprentice silversmith and at 15 she trained as a bookkeeper. Throughout her adolescent working life, Ursula’s desire for artistic expression continued. In 1974, after her recovery from back surgery, Ursula and her husband Carl chose to live as pioneers on Beck Island, which is located one mile across the bay from Tofino. Between working and raising a family, they remained active in the local art scene. He carved in wood and she carved in stone and painted in watercolour. Their children grew up in a creative and nurturing environment. After living on the island for almost 14 years, they moved their family into the village of Tofino. In 1992 Ursula suffered another injury to her back; this time it took almost a year to regain her mobility. During this period of recovery, she took the time to explore the ‘art’ within. She was driven with a deep desire to be creative; to paint and write again. Painting became instrumental in her healing. She advocates the powerful role of art in healing both the body and the mind. An 'intuitive painter' Ursula continued to develop her impressionistic style and achieved active status as a member of the Federation of Canadian Artists. She participated in various painting workshops, art shows and artist-in-action events in Tofino and other communities on Vancouver Island. In 2014, while facing another year of rehabilitation due to major surgery on her right shoulder, Ursula decided that this would be a good time to write and publish her memoirs. The book is titled, “Once in A Lifetime”. It is her maternal grandmother Iffi that tells the story. She begins with describing her own life as it was at the turn of the century. Society was going towards modernization with electricity, indoor plumbing and the automobile. Grandmother Iffi moves into telling the story of her immigrant granddaughter, Ursula, who searches for and finds a romantic and adventurous life. Ursula eventually grows up to become a wife and mother, living off-the-grid, away from modern conveniences, meaning without electricity or running water, on a tiny and remote island off the west coast of Canada. There she lived for almost 14 years, experiencing life as it might have been during her grandmother's life. On January 11th, 2015, Ursula received her Canadian ISBN number and engaged the professional services of an editor to help bring her self-published memoir to market by the summer of 2015. 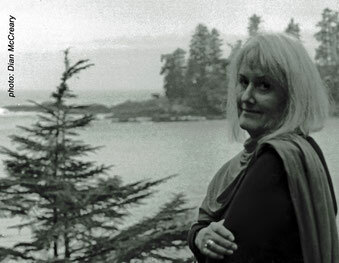 She also became a member of the BC Federation of Writers and the Clayoquot Writers’ Group.